Caledonian Maritime Assets Limited (CMAL) has completed a six month construction programme at Wemyss Bay Ferry Terminal and ferry services will re-start on Good Friday (25 March). The harbour has undergone a £6 million investment and upgrade to secure a safe, efficient and reliable service to Rothesay. During the work ferry services were temporarily diverted to Gourock, but Wemyss Bay will open for travel again in time for the Easter weekend. 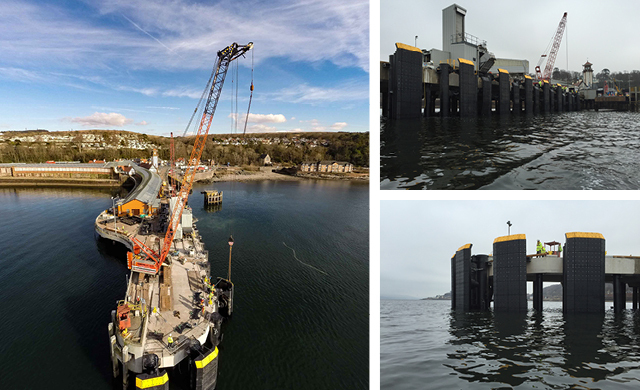 As part of the investment, CMAL installed a new fendering system to replace the pier timber fenders, reconstructed the concrete pier end, refurbished the linkspan and installed a corrosion protection system. The harbour has also been dredged. The upgrades were undertaken and completed on time by George Leslie Ltd, who was awarded the contract in August 2015. 1. CMAL own property at piers and harbours at more than 26 locations throughout Scotland and is embarking on a programme of investment and improvements, which will create better facilities. 2. In addition to its pier and harbour facilities, CMAL owns 31 ferries and lease one further ferry. All 32 vessels are leased to CalMac Ferries Ltd for use on ferry services on the Clyde and Hebrides. In addition, three ferries are currently under construction. 3. CMAL is a publicly owned company with Scottish Ministers as the sole shareholder.